Hallo my friend... My name is Maciek (Siwy) Polski. Im 15 years old. 1 Hallo my friend... My name is Maciek (Siwy) Polski. Im 15 years old. 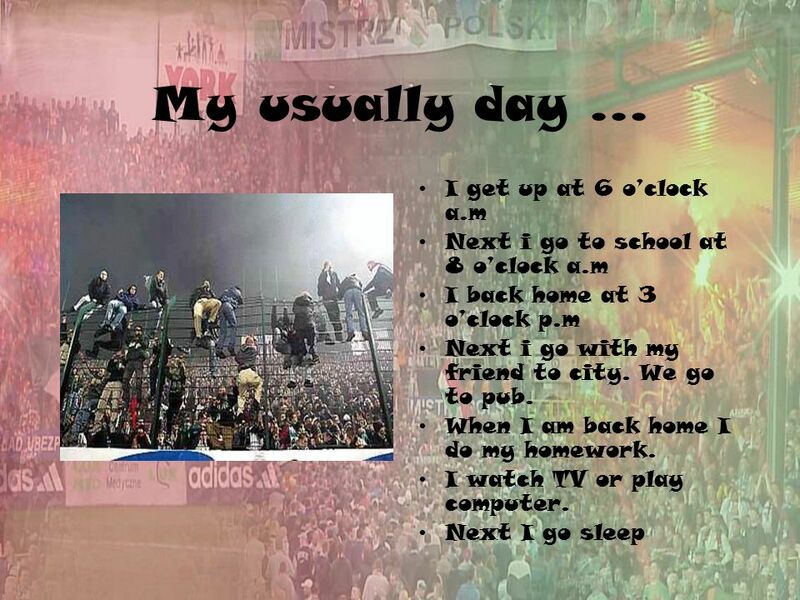 4 My hobby... Of course my favourite hobby is football, my favourite club is Legia Warsaw. Legia is the best football team in Poland. They have won the champions title 8 times. I love this game and this club. I like play computer, too. My favourite game is Star craft, Quake Counter Strike and Championship Manager. 5 My favoutite kind of music... My beloved kind of music is Hip-Hop The most popular group in Poland is Paktofonika, Wzgórze or Trzycha. 7 Where I would like to go... I would like go to Spain, because it is very hot there. Spanish girls are hot and beautiful too. 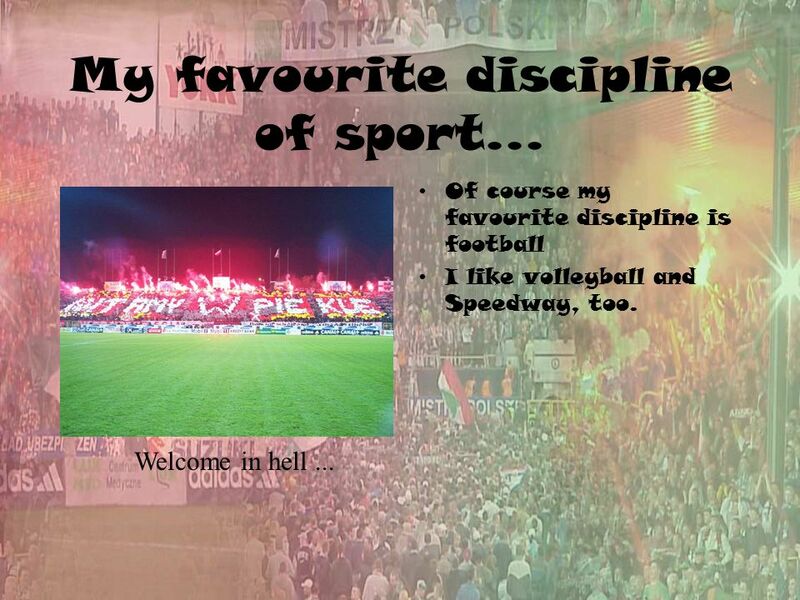 Download ppt "Hallo my friend... My name is Maciek (Siwy) Polski. Im 15 years old." My Hobby: Football Ardelean Razvan. SZKOŁA PODSTAWOWA NR 17 W KOSZALINIE. The most popular free time activity among Polish students is using computers. Some students surf the net and communicate. Teenagers and free time By Anna Stepanisheva.. The number of participators 15 people. Age: 14 years. E RDINÇ Class:12-B Number:98 KIRIS My name is Erdinc Kırıs and I use clear for men. (: Im 17 years old.My length is 177 cm. I was born in İstanbul/Kadıköy. Hi My Name Is Khalil Go the mighty blues and l always going to watch football team for membership full 4 months yeyy.  We chose free time for our question because we like different sports and free time activities.  We were interested in free time activities from different. I am Hakob Manvelyan. I am 11. I live in Yerevan.I am study in 《 Mkhitar Sebastaci 》 and. I am like my school, because this school usually go to trip. That‘s me My name is Rey. My name is Rey. I‘m twelve years old. That‘s me My name is Kevin. I‘m 12 years old.. My hobbies My favourite hobby is playing football. I like playing football, but I don‘t like playing handball. 1 By Justin Roberts, The Soccer Game. 2 This story is dedicated to: My friends and family.